Today one of my students was telling me about a comparatively recent exhibition by brothers Jake and Dinos Chapman. 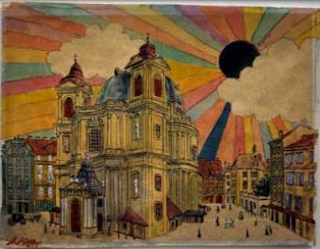 Titled If Hitler Had Been a Hippy How Happy Would We Be, the exhibition ran at the White Cube gallery during May 2008. In preparation for this show, the Chapman brothers bought several watercolors by Hitler. 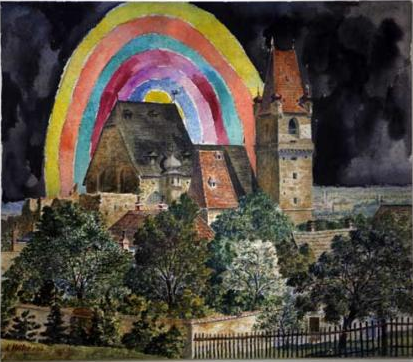 Then, the two brothers painted the backgrounds of Hitler’s watercolors with rainbows, smiley faces, floating hearts, and psychedelic skies. This idea of appropriating the work of another artist is nothing new to the contemporary art scene. When hearing about this exhibition by the Chapman brothers, I was immediately reminded of John Fekner’s X Americana X series (1985), in which Fekner painted over “found” kitsch paintings. But this exhibition by the Chapmans is different than Fekner’s series. Why? Well, because it’s Hitler’s art. The Chapman brothers insist that they are not trying to profit from Hitler’s notoriety with their exhibition, but simply try to explore Hitler’s psychology. Personally, I think that first claim is ridiculous. Of course these artists are trying to get attention and profit because of the connection with Hitler – there’s no way around that fact. If they were purely interested in the “psychology of the artist,” I think they could have explored that idea without publicizing Hitler’s name. Granted, Hitler does need recognition for his contribution to the show. And yes, the psychological connection with Hitler is terribly interesting. But one can consider the “psychology of the artist” with pure visual elements, without knowing who created the work of art. As you can imagine, this exhibition caused quite a bit of controversy. Some find Chapman’s work to be unethical and unrespectful, while others feel like Hitler’s art deserves to be defaced. You can get a sense of some previous discussions on the topic here. Personally, I don’t have a problem with these paintings being “tweaked” by the Chapman brothers. (But I know this reaction is because I’m not that excited about Hitler’s artwork in the first place.) I would have been bothered if Chapmans additions had defaced the bulk of Hitler’s compositions and figures, but that doesn’t seem to be the case. The work of the original artist is still there, but the context and meaning has changed. 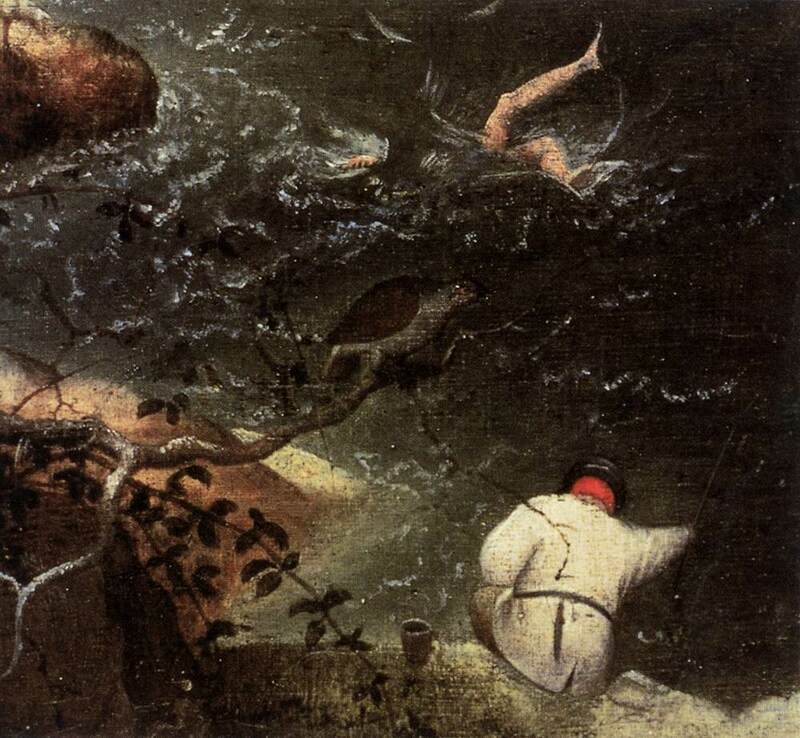 Given that Bruegel was strongly influenced by oral tradition, it also seems likely that this painting refers to the popular proverb, “No plough stops for the dying man.” Up until Wednesday, I have always thought that Icarus was the “dying man” shown in the painting (notice Icarus’ flailing legs as he falls into the sea). However, it looks like Bruegel included two dying (or dead!) men in this scene, perhaps to really emphasize this popular proverb. Crazy, huh? After noticing this corpse, I decided to do a little research and find out what scholars had say on this topic. Lyncle de Vries discusses how the inclusion of this corpse emphasizes a message about brevity of life.2 This interpretation makes sense, and ties into my idea that Bruegel wanted to reference the popular proverb that I mentioned earlier. 1 Kim Woods, “Pieter Bruegel the Elder and the Northern Canon,” in The Changing Status of the Artist by Emma Barker, Nick Webb and Kim Woods, eds. (London: Yale University Press, 1999), 181-82. 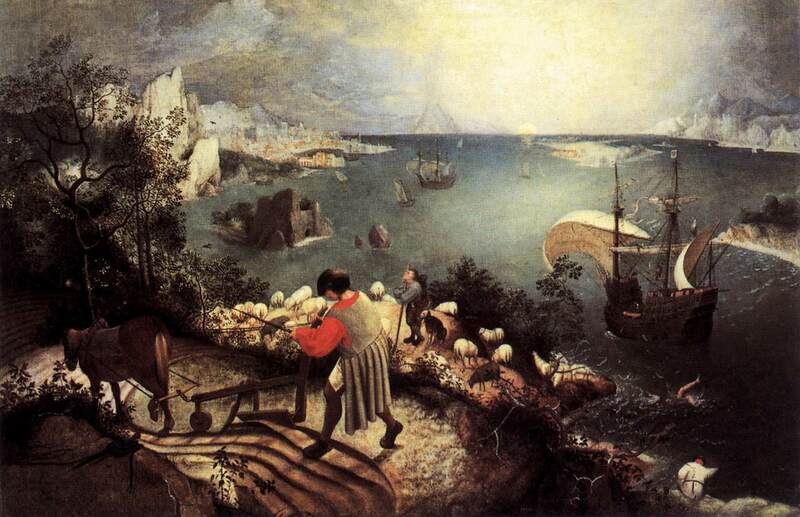 2 Lyncle de Vries, “Bruegel’s Fall of Icarus: Ovid or Solomon?” Simiolus 30, no. 1/2 (2003): 17. 3 Robert Baldwin, “Peasant Imagery and Bruegel’s Fall of Icarus,” in Konsthistorisk Tidskrift, LV, 3, (1986): 101-114. Citation available online here. 4 Karsten Harries, Infinity and Perspective (Cambridge, MA: MIT Press, 2002), 101. Citation available online here. I think Versailles is a big deal. And I don’t mean that the palace of Versailles is big in terms of physical space (that fact is beyond obvious! ), but I have long thought that Versailles needs to have more recognition for its role in art history – particularly in terms of why France became the art capital of the world in the 18th and 19th centuries. Up until this point, I’ve never seen a fantastic explanation for how and why the artistic scene shifted from Italy (and Southern Europe) to France. A lot of possible ideas for this shift could be put forth, such as the establishment of the Academie de peinture et de sculpture (Paris) in 1648. Obviously, this artistic academy helped to promote art and establish France within the artistic scene, but I don’t think that this event caused Europe to focus its attention on France. Likewise, if one looks to the 18th century, it is easy to pinpoint how the establishment of the Louvre museum in 1763 was connected to France’s preeminence among the arts (not only so that artists could study art, but in terms of France becoming a major artistic attraction for tourists). Although these are both very significant events, I don’t think that either the Louvre or French Academy was the initial cause of a major geographic shift in Europe’s artistic scene. Instead, I really think that it was the redesign of Versailles which brought France to the forefront of the European art scene. 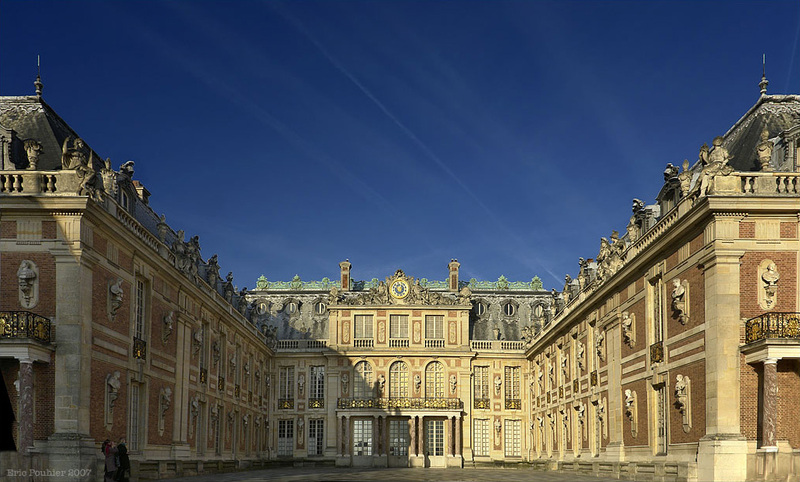 Versailles, which originally functioned as a hunting lodge, underwent a major redesign and enlargement in the 17th century. 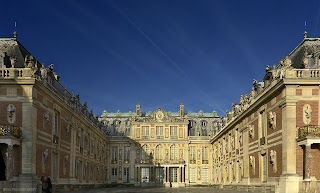 One of the major additions to the palace was begun by the architect Le Vau in 1668. Subsequent additions, remodels, and changes were made over the next several years (including he creation of the “Hall of Mirrors,” which was begun in 1678 by Hardouin-Mansart and Le Brun). Louis XIV finally moved to the palace in 1682, and eventually required his court to live at the palace as well. Versailles was over-the-top in terms of luxury, space, and design. It was so huge and so ostentatious that it immediately attracted the attention of other countries. 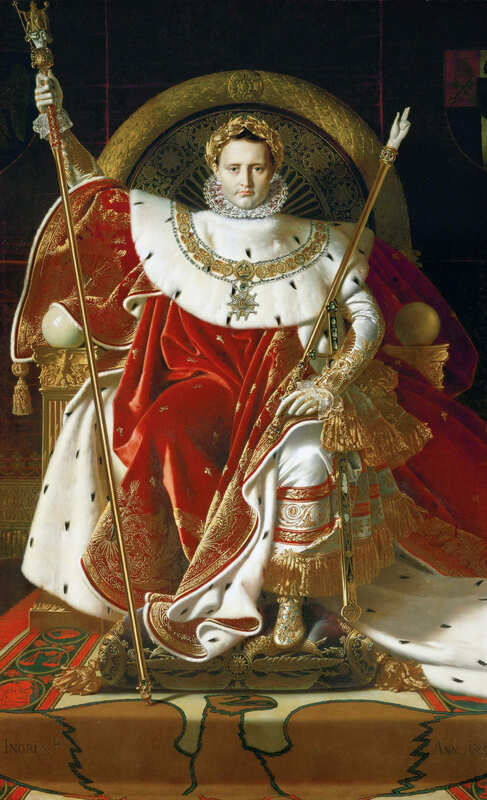 In fact, Versailles was so impressive that many European monarchs wanted to model their own palaces after Versailles. Subsequently, Baroque palaces popped up all over Europe. You can see a great compilation of Baroque residences here (complete with photographs). One such Versailles-inspired palace was the Würzburg Residenz, in Würzburg, Germany (1720-1744, shown above). In essence, Louis XVI became a major trend-setter with Versailles. Everyone wanted to live like him. And, consequently, I think that this is the reason that the art world moved to France. Europeans focused their attention to French art and architecture, a focus that would continue for over two centuries. Although I don’t think that Versailles is the sole reason that the artistic scene shifted to France, I think the remodeling and establishment of court at Versailles are very pivotal points in art history. Obviously, I’m a little biased as a Baroque scholar, but I can’t overlook Versailles on this point. It’s just too big - both physically and metaphorically! Can you think of historical events which helped to foster (or solidify the presence of) the artistic scene in France? *Photo of Versailles courtesy of Eric Pouhier, as found on Wikipedia. 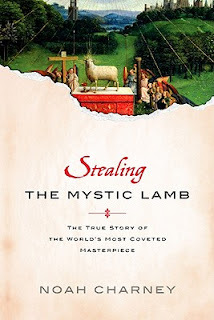 This past weekend I finally finished reading art historian Noah Charney’s book Stealing the Mystic Lamb: The True Story of the World’s Most Coveted Masterpiece. I’ve wanted to read this book for a long time, and I finally got my hands on a copy over a month ago. It took me several weeks to read this book, not because it was boring, but because I kept pausing to type notes on my computer. And now, with eighteen pages of notes in my computer files, I have finally finished the book. Phew! Although I liked all of the book, I think that I enjoyed the first half of the book a little bit more. In this first half, Charney races through several centuries of history in a lively discussion of the altarpiece’s creation and thefts before WWII. I really enjoyed the quick, animated pace in the first few chapters. The latter half of Charney’s book slows down considerably to focus on just one historical event: the theft of the Ghent Altarpiece by Nazis during WWII. The altarpiece panels, which were intended to be placed in Hitler’s super-museum for art, were kept in the Alt Aussee mine in Austria. Although I thought that this story was still very interesting, it took a some mental adjustment to move at a slower pace in terms of chronology. P.S. There is a great interview of Noah Charney on Three Pipe Problem. Be sure to check it out! 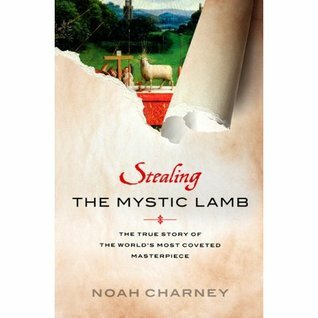 1 Noah Charney, Stealing the Mystic Lamb: The True Story of the World’s Most Coveted Masterpiece (New York: PublicAffairs, 2010), 104. Almost exactly five years ago, I gave my first research presentation in a graduate seminar. This seminar was dedicated to Northern Baroque art, and I chose to write on the Dutch artist Albert Eckhout. However, even though Eckhout is Dutch, I am mostly interested in the paintings he created while living in Brazil. 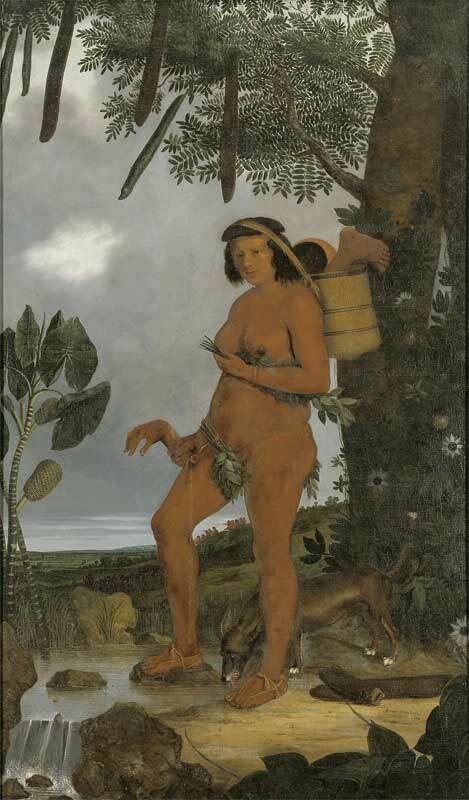 The Dutch established a colony in Brazil (called “The New Netherlands”) in 1636, and the following year Eckhout traveled to the new colony as a commissioned artist. The governor-general of the colony, Johann Maurits, wanted Ekhout (and fellow artist Frans Post) to work as documentarists and paint the flora, fauna and indigenous people of the area. As part of the work, Eckhout painted eight portraits of the different indigenous people in the area, including Tupi Woman (c. 1641-44, shown right). However, in my graduate presentation, I argued that even though Eckhout was hired as a “documentarist,” he doesn’t visually record the native people with a dispassionate eye of scientific observation. Nor do I think that these portraits were displayed as scientific images. Instead, I see these Brazilian portraits as a symbol of conquest. For one thing, Governor Maurits chose to display these portraits within his Vrijburg palace in Dutch Brazil. Maurits not only “owned” the subject matter within the painting, but the native people were therefore captured, defeated, and regulated to the walls of the palace. Furthermore, Eckhout continually emphasizes the “Otherness” of the subjects of his Brazilian portraits. These portraits encourage the viewer to understand and define them on a basis of comparison against Western culture. As can be seen in his Tupi Woman, Eckhout is interested in emphasizing the cannibalism and nakedness of this native group. Ethnic stereotypes can be seen in the other portraits too. The Mameluke Woman (c. 1641-44, shown left) is depicted as a coquettish concubine in garb that is quite non-European (not only with the loose fitting dress, but because she apparently isn’t wearing a girdle or underclothing). 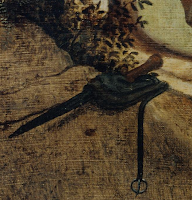 Her raised dress and exposed leg suggest the sexual “profitability” of native people to the conquering Dutch. In fact, these mameluke women (a mixture of Indian and European blood) were stereotypically seen by the Dutch as being promiscuous and sexually available. These portraits are created on a large scale (they are life size), which could imply that Eckhout was attempting to elevate and honor the Brazilian natives in his paintings. In fact, my professor suggested as much when she critiqued my graduate presentation. She also pointed out that the trees in the background form a makeshift “cloth of honor,” a visual tradition found in other Northern European portraits of nobility. Although I can see how one could interpret these aspects positively, I think that an opposite stance can be taken. 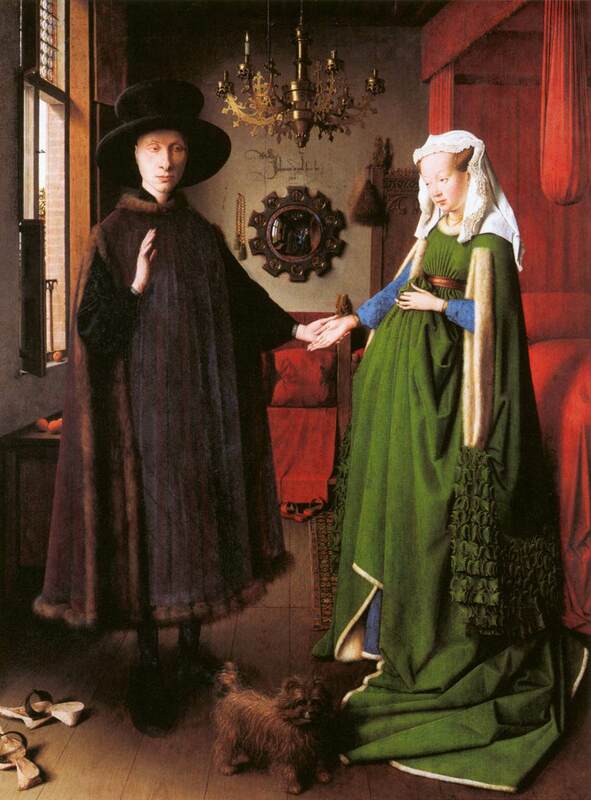 I think that the grand scale and “cloth of honor” actually magnify the “Otherness” of the sitters. The Tupi woman is not only naked, but she’s really naked. She’s large-scale naked. And she doesn’t really get a “cloth” of honor, does she? Instead of luxurious red velvet, this woman is shown in front of a native tree which furnishes imposing, machete-like pods.1 I’m not sure if that is really ennobling. I think the uncomfortable juxtaposition of Western traditions (the grand scale painting with an impromptu “cloth of honor”) with non-Western subject matter makes the “Otherness” of the subjects even more apparent. What do others (and Others!) think? Do you think that the grand scale and “cloth of honor” serve to ennoble these indigenous portrait sitters? Why or why not? 1 I should point out that trees previously had been used as natural “cloths of honor” in Northern Baroque art (consider Van Dyck’s portrait, Charles I at the Hunt (1635)). 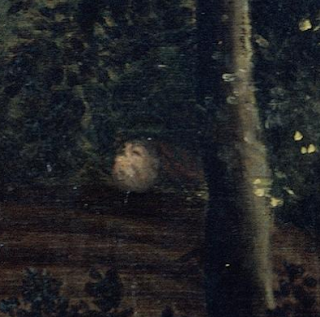 In the Charles I portrait, however, Van Dyck doesn’t try to draw much attention to the tree. Instead, the tree is mainly used as a framing device. I think this is different from Eckhout’s portraits, who takes pains to emphasize the non-Western nature of the plant life. **When pulling together my previous research for this post, I also stumbled upon a book that was written in 2007 (one year after my graduate school presentation). I’m very curious to read Rebecca Parker Brienen’s book, Visions of Savage Paradise: Albert Eckhout, Court Painter in Colonial Dutch Brazil. From what I can tell online, she and I are interested in the same topics and interpretations for this piece. Like Brienen, I think that Eckhout’s work is “informed by sexual as well as ethnic stereotypes.” We must have been researching these ideas around the same time. Fer Hegel’s Geist! You can see a preview of Brienen’s book here.